(Mr. Jerry Mathema (second from left) with other 2017 Jay Jordan OCLC/IFLA Early Career Development fellowship) Picture provided by Mr. Jerry Mathema. Last year I was offered the Jay Jordan Online Computer Library Center (OCLC) /International Federation of Library Associations and Institutions (IFLA) Early Career Development fellowship. This gave me an opportunity to stay in the United States of America (USA) with four other participants chosen from across the globe for four weeks learning new technologies in the Library and Information Science sector with privilege to meet leading US based industry leaders. 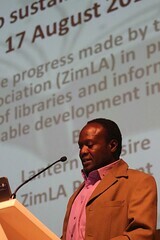 I am the second Zimbabwean to take part in this program after Masimba Muziringa. The selection of 2017 fellows brought to 85 the number of librarians and information professionals from 38 developing countries to have participated in the programme since its inception 15 years ago. The fellowship was based at OCLC Headquarters in Dublin, Ohio, USA from 17 March through Thursday 13 April 2017 were I joined Patience Ngizi-Hara from Zambia, Eric Nelson Haumba of Uganda, Sharisse Rae Lim of the Philippines and Nguyen Van Kep of Vietnam. Jay Jordan OCLC/IFLA Early Career Development fellowship is jointly sponsored by IFLA and OCLC to provide advanced continuing education and exposure to a broad range of issues in information technologies, library operations and global co-operative librarianship. 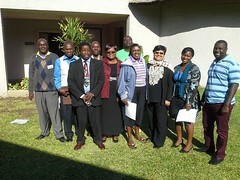 Fellowship participation involves discussions with library and information science leaders, library visits and professional development activities for the four-week programme. During the training programme we had an opportunity to observe OCLC’s governance structure in action, gaining insight into issues affecting the global library co-operative by attending the Global Council Meeting. Some of the industry leaders we met included the first female and African American Library of Congress Librarian, Ms. Carla Hayden, Mortenson Center’s Distinguished Professor and Librarian Sarah Chu, President of the OCLC Global Council, Peter Sidorko and OCLC President and Chief Executive Officer, Skip Pritchard. Some of the institutions and sites visited included Ohio State House, Ohio State University Library (Thompson, Research Commons and Depository), Westerville Public Library in Ohio, Otterbein University in Ohio, Columbus Art Museum, Library of Congress & Smithsonian’s Archives, Museum of African Art, Native Indian Museum, in Washington DC, The University of Chicago, Chicago, Illinois, The Graduate School of Library & Information Science’s Mortenson Center at Urbana Champaign, Illinois and the Indianapolis Public Library in Indiana. We also visited the American Library Association (ALA) Offices in Chicago, Illinois were we discussed issues relating to building strong library associations with the International Relations Officer, Mr Dowling. We were later honoured with a one year membership subscription of the ALA. The entire programme is a capacity building platform that equipped participants with new skills, knowledge and technical expertise for the ever growing library sector. With the newly acquired skills, I am set to transform the working environment at my workplace. I would like to encourage other Librarians and information professionals from Zimbabwe to apply for the fellowship for the next recruiting cycle.